Product #60614 | SKU 5-322 | 0.0 (no ratings yet) Thanks for your rating! 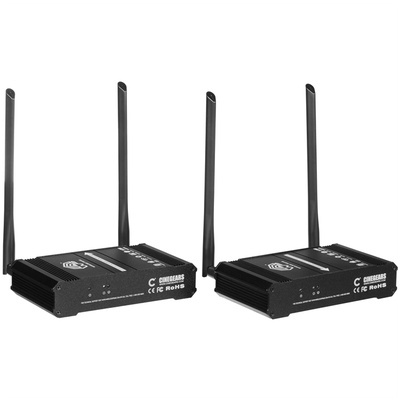 The Cinegears Wireless Prime HDMI 4K Kit (Encrypted) is a true 4K, fully wireless HDMI extender, featuring long transmission distances and pairing encryption that protects the HDMI signal. It transmits up to Ultra HD 4K signals natively without scaling, with a low latency of 200 ms. It's ideal for use in the home, for videoconferencing, surveillance applications, digital signage, and more. Simply connect an HDMI source into the transmitter, and the signal will be carried to the receiver for up to 650 ft (198m) without any cables. The receiver has an HDMI output for connecting the signal to most large displays. Including an IR transmitter/receiver set and built-in IR pass-through capabilities, the Wireless Prime Kit also lets you conveniently control your playback remotely.